The town of Derby is located on the tidal mud flats on the edge of the King Sound. It has the highest tidal range of any port in Australia. The boab tree is a major feature of Derby. It has been used as a street tree and many of the larger growing natural specimens have been preserved. The famous Boab Prison Tree is located 7 kilometres from the town. The town had its origins in the pastoral and mining industries. It developed as a Port to service the pastoral properties along the Fitzroy River after the exploration of the area by Alexander Forrest in 1879. Pearl luggers collecting in the Buccaneer Archipelago also used the Port after it was established in 1883. Then the town boasted a police detachment and Government residence. By 1884 a hotel, jetty and tramway were being constructed - all firsts for the Kimberley. The 1886 gold rush at Hall’s Creek led to a boom in development. The pastoral and mining industries and administration and tourism continued to be the main impetus in the town. Minerals found in the hinterland include oil at Blina, diamonds in the Phillips Range, facing stone from the King Leopold Ranges and lead and zinc from Cadjebut. In 1997 the Derby wharf, which was closed in the 1980s, was re-opened for barging operations for the export of the lead / zinc concentrates. A tidal power plant is being considered for using the tidal flush of Doctor’s creek near the town. 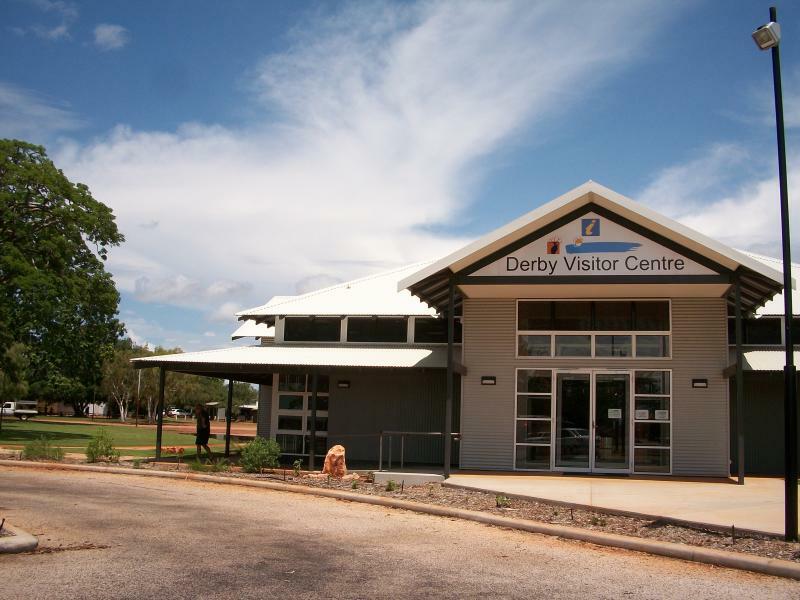 Derby is the main base for the Royal Flying Doctor Service in the Kimberley. The base was established in Derby in 1955.